A guided history walk of Crosspool departs from St Columba’s on Tuesday 30 June at 10am. If you’re interested in doing the guided walk but can’t make Tuesday morning, we would be prepared to arrange an additional evening walk sometime in the next few weeks. Please email lindseybeagles@gmail.com if you’re interested. 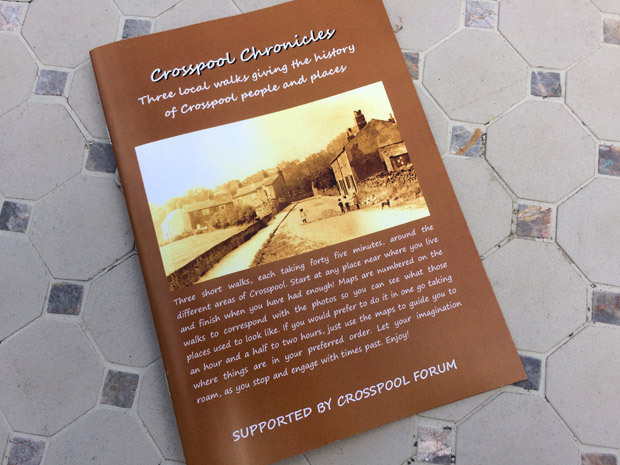 Meanwhile, Crosspool Chronicles, the guide to walking round Crosspool and reading about the people and places in times gone by, is for now on sale at the price of £2.50. This entry was posted in businesses, crosspool, crosspool festival 2015, for sale, health and fitness, history, shops and tagged bamforth's, charisma, cocker and carr, crosspool chronicles, crosspool pet supplies, walk. Bookmark the permalink. I attended this morning the history walk very informative, Jan was excellent. could we please have one in an evening as my partner and friends would love to go too.